The third installment of the oh-so-cute Alvin and the Chipmunks is now showing in Manila! Alvin, Simon and Theodore, along with the Chippettes and their 'dad', Dave, is going for a family vacation on a cruise ship before going to the International Music Festival. Alvin, as always, got the whole gang into trouble which brought them into an island. Dave attempts to rescue the chipmunks and the chippettes, and unexpectedly tags the former villain Ian along. 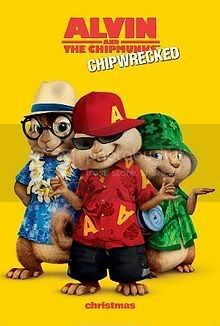 The chipmunks meets an island resident named Zoe, a spider bits changes timid Simon into adventurous Simon, which makes Alvin responsible in taking care of his brothers and the chipettes. This movie emphasizes the value of obedience and taking responsibility for your actions. Alvin took responsibility by building a tree house all by himself, and took charge of making a boat for them to flee the island. He owned up his fault by saying sorry to his 'dad', Dave, who loves him unconditionally. Aside from the values taught by the movie, I love the Chipmunks version of Lady Gaga songs like "Bad Romance" and "Born This Way". I also love their versions of "Party Rock Anthem", "Fireworks" and "Conga". It's one movie you really should watch. First movie this 2012: check! Hi Stephanie! You should see the first and second. :D You'll love it! this new chipmunk movie is very great! there are many great parts. this new chipmunk movie is very great. 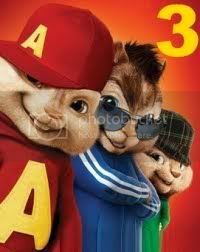 these little chipmunks are funny,look cool, and there voices are cool. if you dont think so , then dont ruin it for people. i heard many commets. the people who are saying the bad commets about this movie are adults and teenagers. ..... must see this movie!!! !